We’re not getting any younger, but thankfully advanced technology is helping us feel more youthful and full of energy than ever before. The PlaneAire™ team takes their overall health extremely seriously, from keeping germs at bay on flights to uncovering the next best plant-based beauty product for radiant skin. For those who are new to the spa life or are avid spa-goers looking for the next beauty trend, here are four experiences that are sure to elevate your wellness goals this year. The Quick Fix: IV Drip treatments are known to thoroughly hydrate you and add a vitamin, mineral and amino acid boost to your bloodstream in levels that would be impossible to absorb orally. This quick intravenous method is not just accessible by celebs anymore, it has gone mainstream. IV therapy wellness centers are opening across the country, such as NutriDripin New York City and Infuse Wellness in Santa Monica, Thrive Drip Spa in Houston, Drip IV Therapy in Kansas City and The Drip Room in Scottsdale, AZ. Plant-Based Retin-Alt: Bakuchiol (pronounced bah-ku-chee-ol) is a new, gentler, plant-based alternative to Retinoid (which can cause dryness, irritation and sun sensitivity) to combat issues of pimples and sun damage on skin. Derived from the babchi plant, it is rich in Vitamin E and shown to reduce photodamage, firm skin, diminish fine lines and help stimulate collagen. Experience this ingredient in Vance Soto’s Ole Henriksen Spa in LA where they use the Transform Plus serums and moisturizers. A New Workout-For Your Face: Guerlain’s skincare products are renowned for harnessing the power of nature to formulate creations and their innovative Beauty Lift will let you experience them with a bit of a workout. 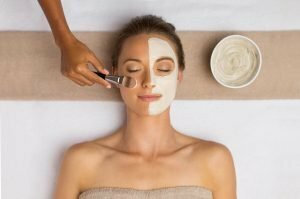 This spa treatment nourishes the skin with a facial mask while you receive an arm and shoulder massage, and then a dynamic facial massage targets wrinkles and activates microcirculation. The massage focuses on every face muscle to specifically target expression wrinkles, smoothing lines while the stretching technique aims at stretching and relaxing the face in the tensest areas. Immediate results include a radiant complexion, smoothed features and plumped cheeks. Guerlain’s spas are worldwide, including inside The Plaza Hotel in New York City, The Breakers Palm Beach Resort in Florida and the Four Seasons in Shanghai. Get Your Glow On: This popular facial gives your skin a gorgeous glow using soothing spa therapies combined with advanced technology. Through a medical-grade hydradermabrasion device, aestheticians remove dead skin cells through exfoliation, extracts impurities and then infuses new skin with hydrating serums and antioxidants. Spas all across the globe are offering this treatment. For Jersey residents in the Princeton area, you can receive this treatment at Hazen Med Spa (you might bump into a PlaneAire™ team member while you’re there)! Their Brightening HydraFacial will target dark spots and sun damaged areas; whereas, the Dermabuilder HydraFacial addresses fine lines and gives you instant tightness.